High-level nuclear talks in Russia between Iran and six world powers have been suspended after no agreement reached. The EU's top foreign policy official said on Tuesday that high-level nuclear talks in Russia between Iran and six world powers have been suspended, The Associated Press reported. The report added that experts from both sides will meet next month to see if there is enough common ground for new negotiations. 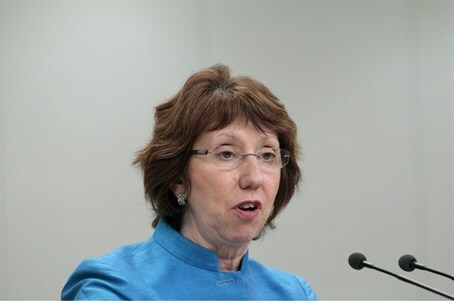 The talks were hosted by the EU's top foreign policy official, Catherine Ashton, who said she will be in touch with top Iranian negotiator Saeed Jalili after the July 4 experts' meeting in Istanbul to decide on when or whether to resume the talks. Ashton spoke Tuesday after two days of talks made little progress in defusing international fears that Iran might turn its nuclear program to making weapons. AP quoted diplomats as having said the negotiations remained deadlocked going into Tuesday, despite pleas from the presidents of the U.S. and Russia for Iran to agree to curb nuclear activities. A top Russian official reportedly met twice with Iran's chief envoy on the sidelines of the talks Tuesday, as the host nation tried to keep negotiations on track. Sergei Ryabkov, Russia's deputy foreign minister, conferred with top Iranian negotiator Saeed Jalili, one of the diplomats told AP. “But if they pursue the path they've been following, any progress in the talks will be stalled," he was quoted as having said. The talks in Moscow followed a bruising session in Baghdad in May that failed to make any noticeable progress beyond agreeing a date for more talks. In a hint of compromise, Iranian President Mahmoud Ahmadinejad said on Monday that Iran is ready to suspend its controversial enrichment of uranium to 20 percent if Europe guarantees delivery of nuclear fuel for its reactors.